Have You Smelled Your Floss Lately? The bad smell after flossing can mean a handful of things. It can mean you are leaving behind that amazing home cooked meal of chicken cordon bleu and asparagus that your wife prepared two weeks ago. It could mean cavities starting in between your teeth, or infection in the gums. Many people think brushing their teeth gets the job done. However, it does not. The plaque that is left behind from not flossing can cause halitosis also known as “bad breath”. Usually people, who do not floss enough, often have gums that bleed. Bleeding gums are not healthy gums. 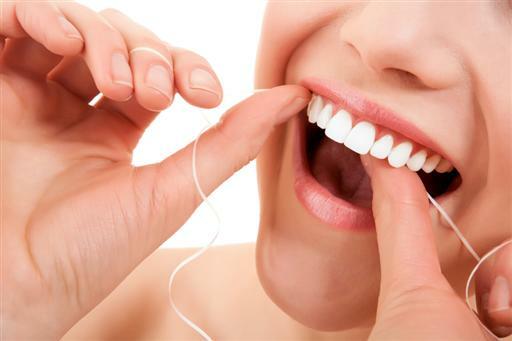 Some see bleeding gums and tend to shy away from flossing because they think flossing cause their gums to bleed. In reality, the more you floss, the healthier the gums are, and the less they bleed. I often think, “If my hands started to bleed every time I washed them I would go to the hospital.” Why do most of us think it is normal for our gums to bleed? Gums that bleed are indications of gingivitis or gum disease. The plaque that is left behind from not flossing or brushing well travels below causing you gums to become flamed. Once the gums are inflamed and infected, the gingival tissue swells and starts to bleed. This can eventually turn in to periodontitis or gum disease if not taken care of. This means the plaque turns into tarter and other harmful bacteria below the gum line and can infect the entire support system for your teeth. This is why your grandmother takes out her teeth, places them on the table, and only eats mashed potatoes at Thanksgiving. So I encourage everyone to not only floss, but go in the bathroom, shut the door and smell it. If there isn’t any blood and it does not smell like your Great Aunt’s fish tank she hasn’t cleaned since the Reagan Administration, you are doing a good job!